Unpacking her belongings in her new hometown of Portland, Oregon, herbalist and reformed alchemist Zoe Faust can't help but notice she's picked up a stowaway. 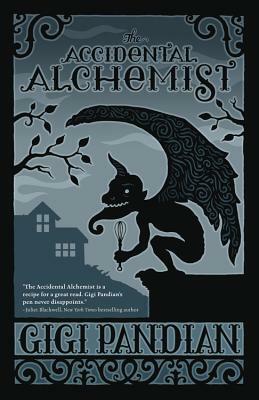 Dorian Robert-Houdin is a living, breathing three-and-half-foot gargoyle--not to mention a master of French cuisine--and he needs Zoe's expertise to decipher a centuries-old text. Zoe, who's trying to put her old life behind her, isn't so sure she wants to reopen her alchemical past . . . until the dead man on her porch leaves her no choice. USA Today bestselling and Agatha Award-winning author Gigi Pandian is the child of cultural anthropologists from New Mexico and the southern tip of India. She spent her childhood being dragged around the world on their research trips, and now lives outside San Francisco with her husband and a gargoyle who watches over the garden. Gigi writes the Jaya Jones Treasure Hunt mysteries, Accidental Alchemist mysteries, and locked-room mystery short stories.